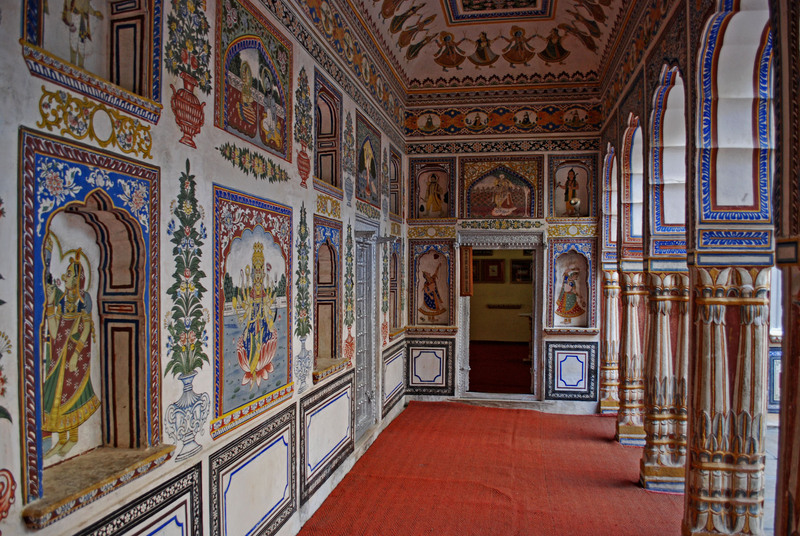 To the initiated, Shekhawati is Rajasthan’s open art gallery. 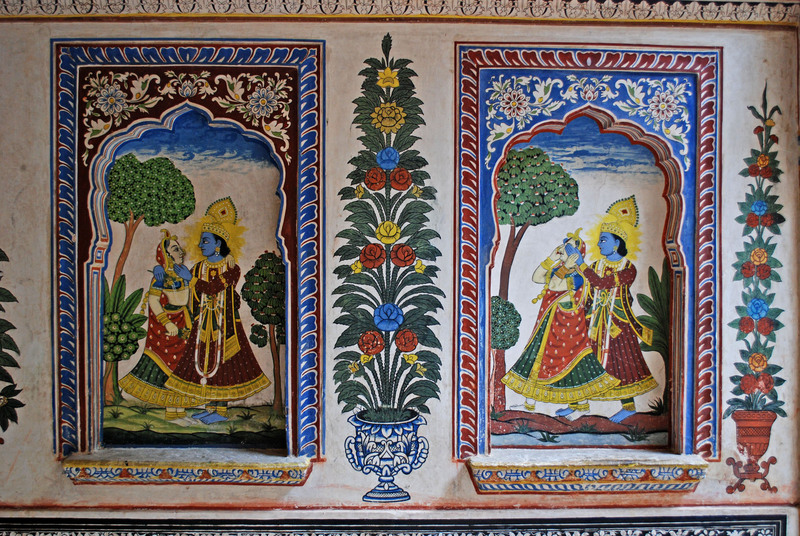 For those who have not heard about it, Shekhawati is a term used to denote a region in northern Rajasthan comprising of the districts of Jhunjhunu, Sikar, Churu and Nagaur. Apart from a long and eventful history, this region has also produced some of India’s best known business families – the Dalmias, thye Murarkas, the Goenkas to name a few. In the 18th and 19th centuries, Marwari merchants moved to and prospered in India’s new commercial centres – Bombay and Calcutta. 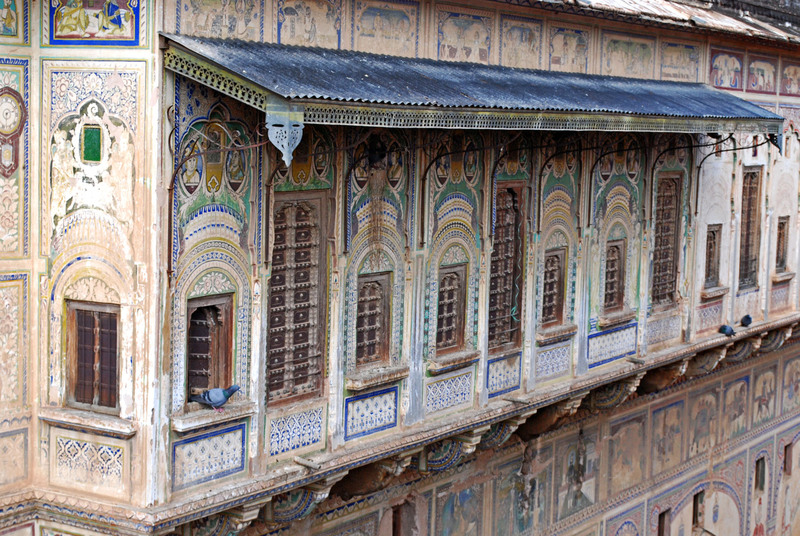 They sent the bulk of their vast fortunes back to their families in Shekhawati to construct grand havelis – to show their neighbours how well they were doing and to compensate their families for their long absences. 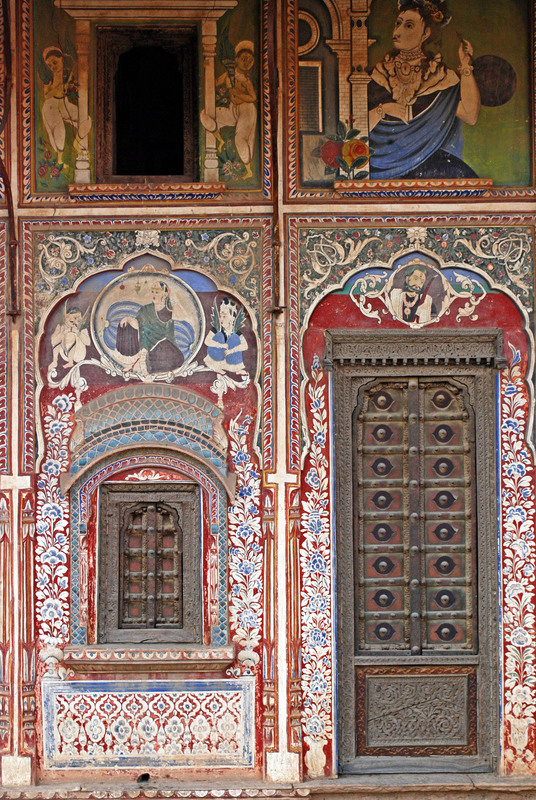 As more and more merchants prospered, it soon became a competition to build ever more grand edifices – homes, temples, step-wells – which were richly decorated, both inside and out, with painted murals. 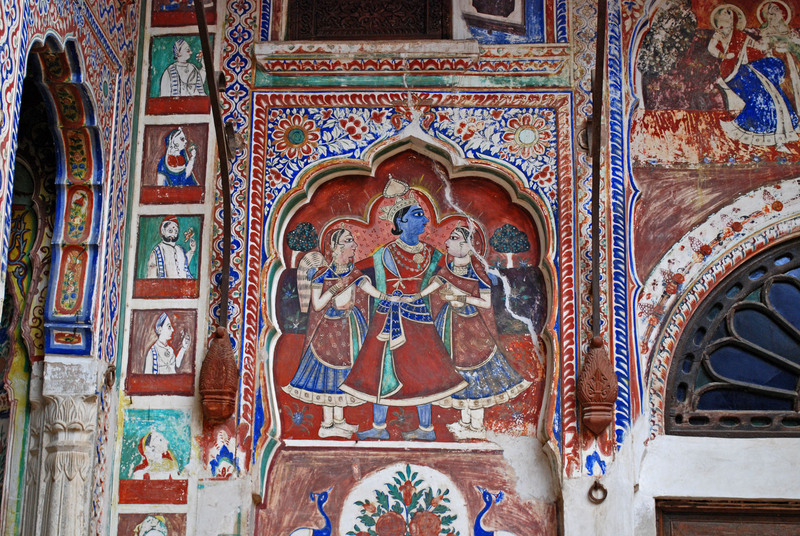 Haveli walls, particularly at the entrance, in the courtyards and sometimes within some of the rooms, were frequently painted by the from the ground to the eaves. Often the paintings mix depictions of the gods and their lives with everyday scenes featuring modern inventions, such as trains and aeroplanes, even though these artists themselves had never seen them. Hence, Krishna and Radha are seen in flying motorcars and Europeans can be observed inflating hot air balloons by blowing into them, or travelling in trains, the compartments of which look like English cottages. On these walls, fact meets fiction, the popular meets the chaste and in some unfortunate cases money meets bad taste. 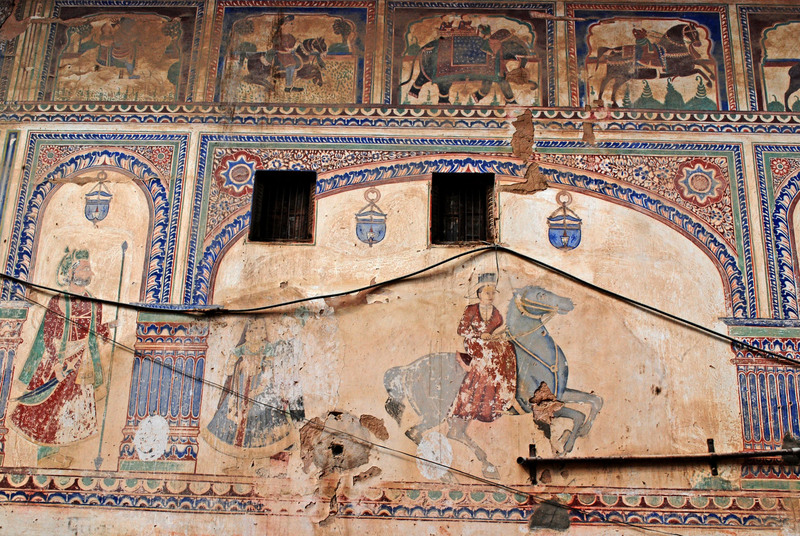 These days most of the havelis are still owned by descendants of the original families, but not inhabited by their owners, for whom small-town Rajasthan has lost its charm. Many are occupied just by a single chowkidar (caretaker), while others may be home to a local family. 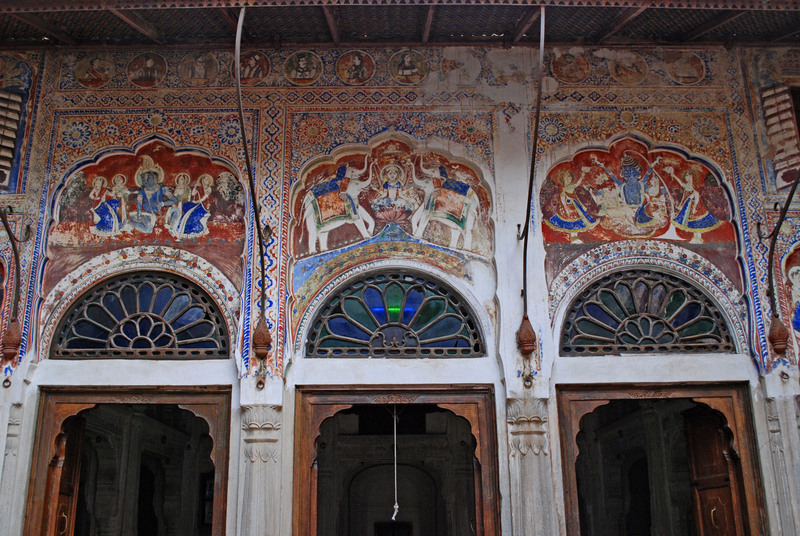 Many of the better known ones have printed brochures and booklets which give an insight into the history of the family and the architecture of the haveli in question. 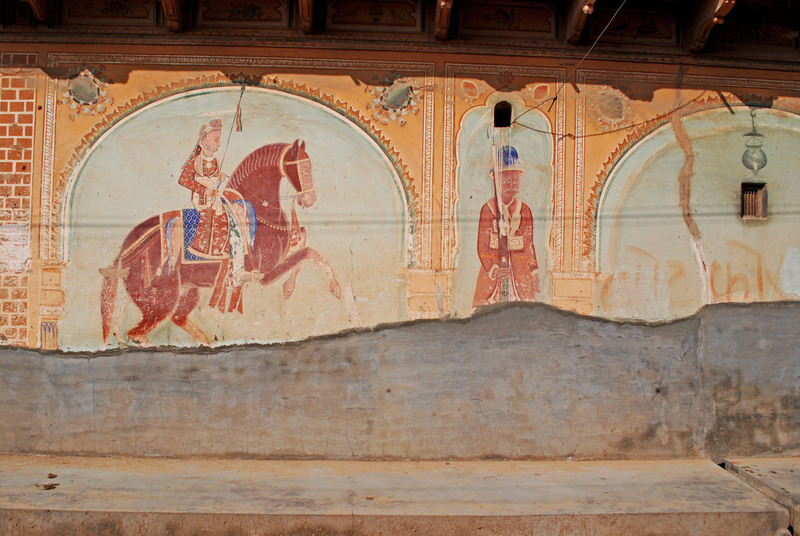 Though they are pale reflections of the time when they accommodated the large households of the Marwari merchant families, they remain a fascinating testament to the changing times in which they were created. 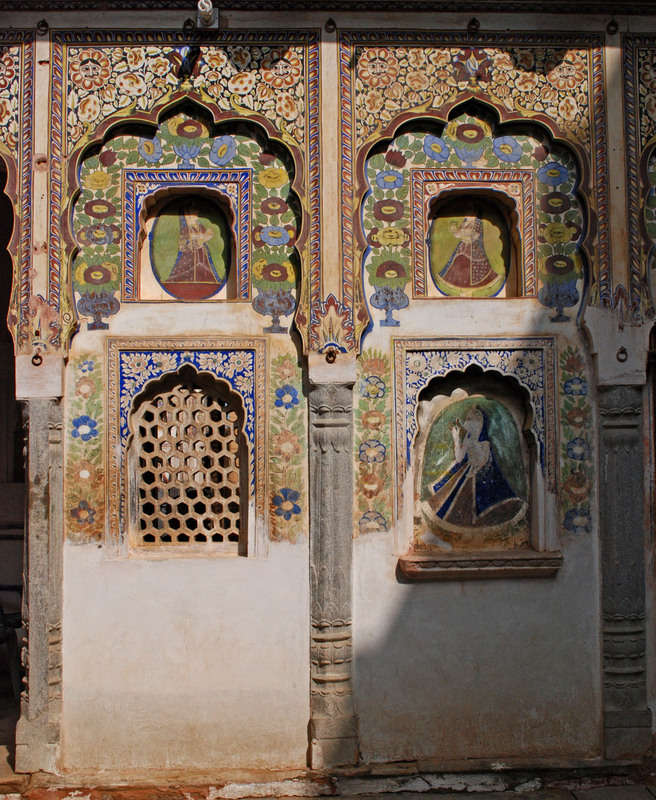 Only a few havelis have been restored; many more lie derelict, crumbling slowly away. In February, i followed my friends Rohit and Sriparna to Rohit’s parents place in a tiny village, around 10 kms outside Jhunjhunu. 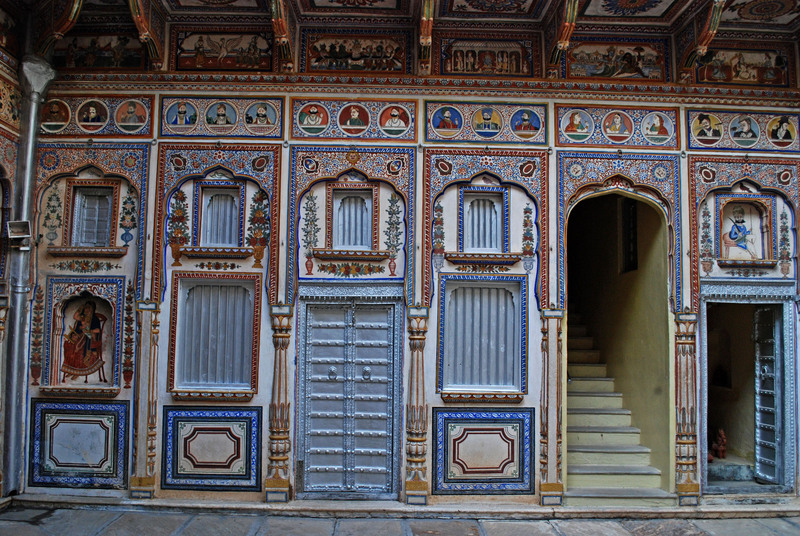 The idea was to relax for a few days in the village, take long walks, and if possible visit one of the towns and check out the Havelis. After much deliberation, we decided to head to Nawalgarh. 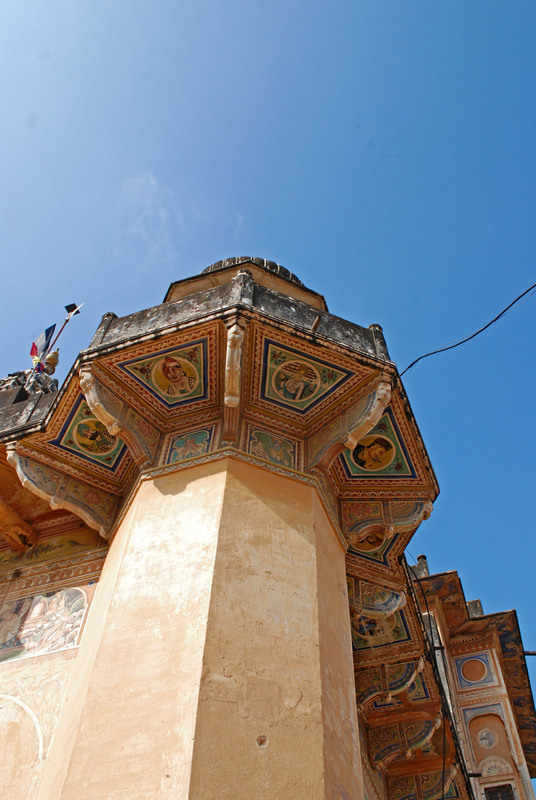 Nawalgarh, founded in 1737 by Nawal Singh is almost at the centre of Shekhawati. 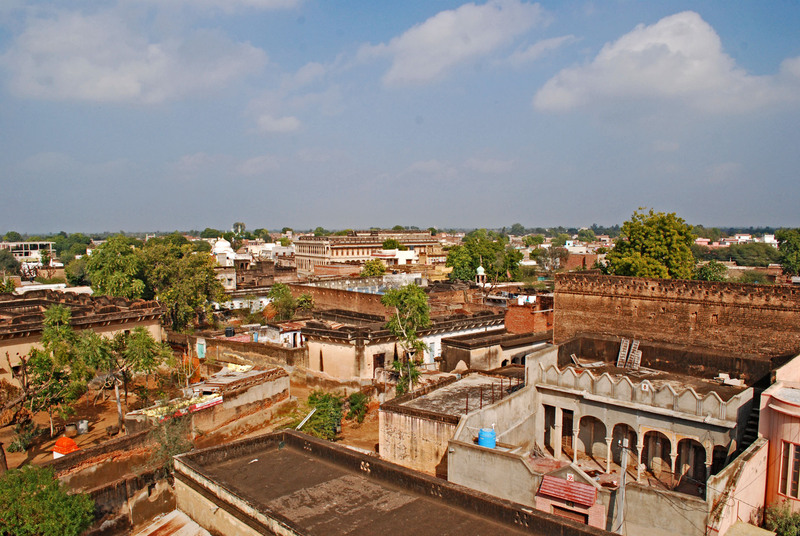 Nawalgarh is quite compact, and most of its havelis are centrally located and easy to reach on foot. We started our tour from Morarka Haveli which is a good point to start your tour as most guides (you will need one) congregate here. Please remember that most havelis have individual tickets . 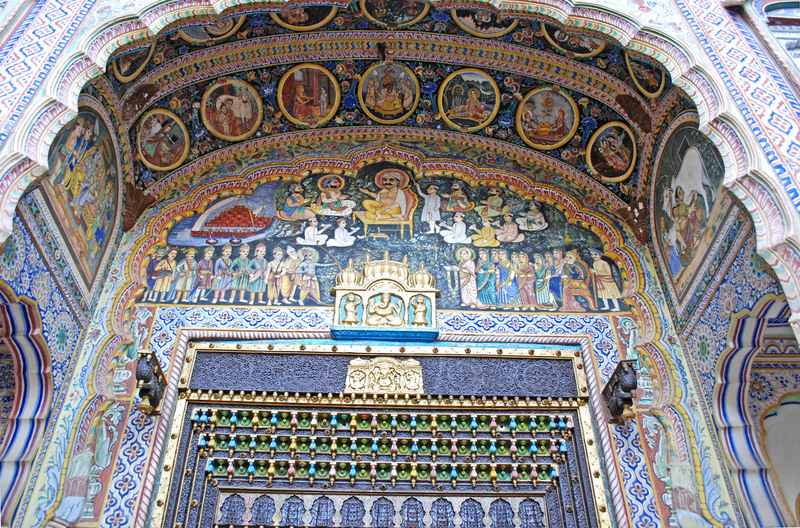 Stained glass and paintings decorate the entrance to the baithak. 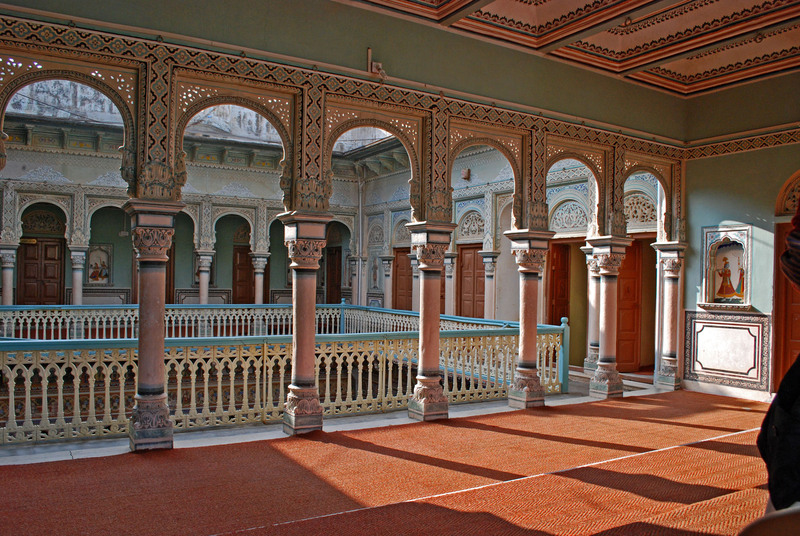 Haveli is a Persian word that means ‘an enclosed space’. 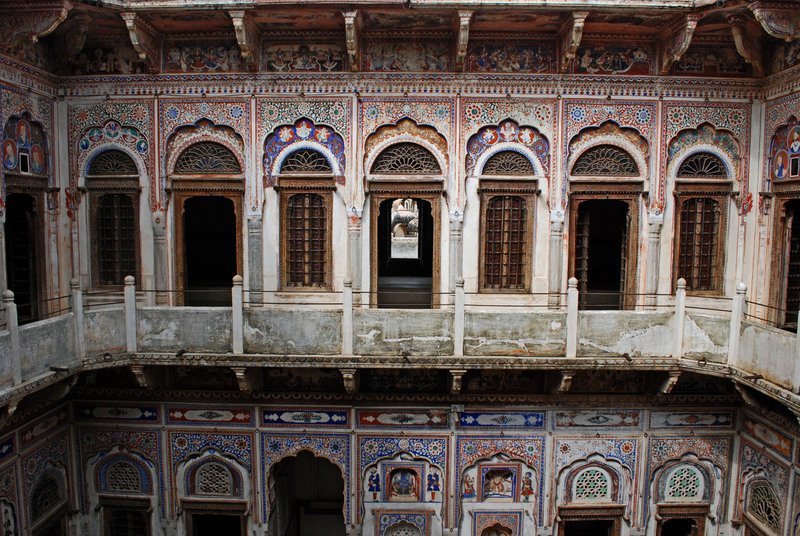 But contrary to its literal meaning, the architecture of the haveli did much more than simply enclose space; it in fact provided a comprehensive system that governed the everyday lives of its inhabitants. 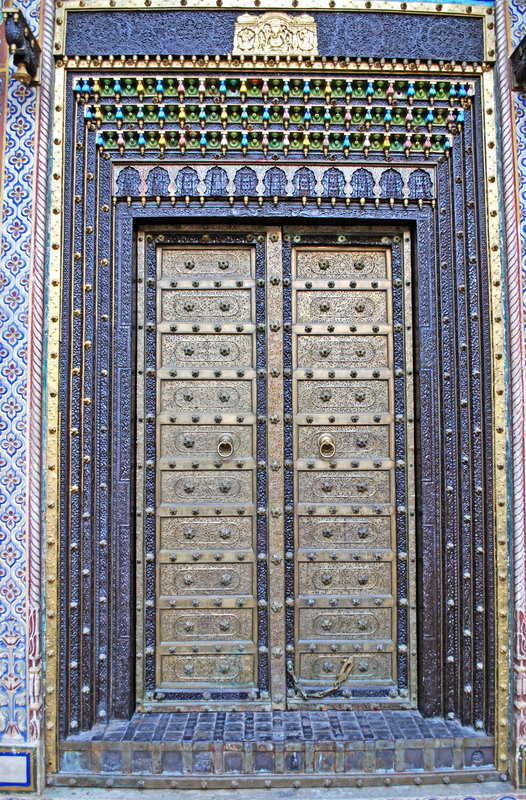 Most havelis are entered through a massive arched gateway, protected by a solid wooden door. 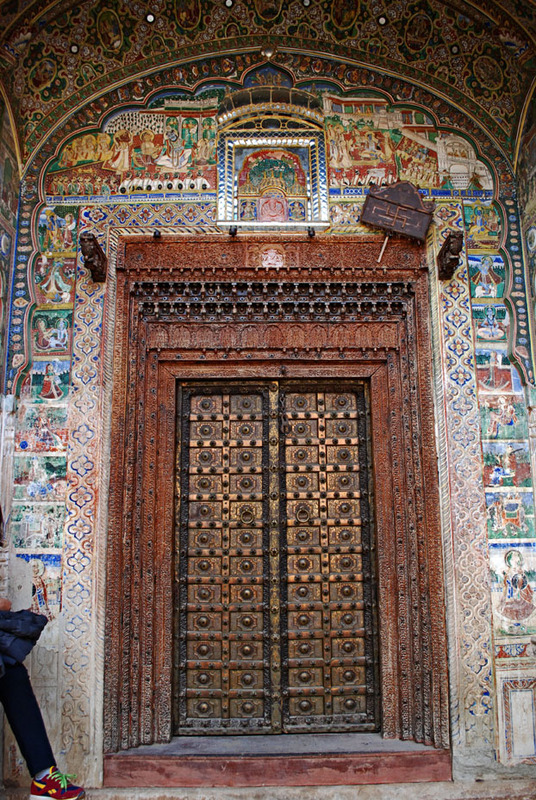 While most of the times the larger door is locked, a smaller portal carved within the larger door allows people into the first of the many courtyards. 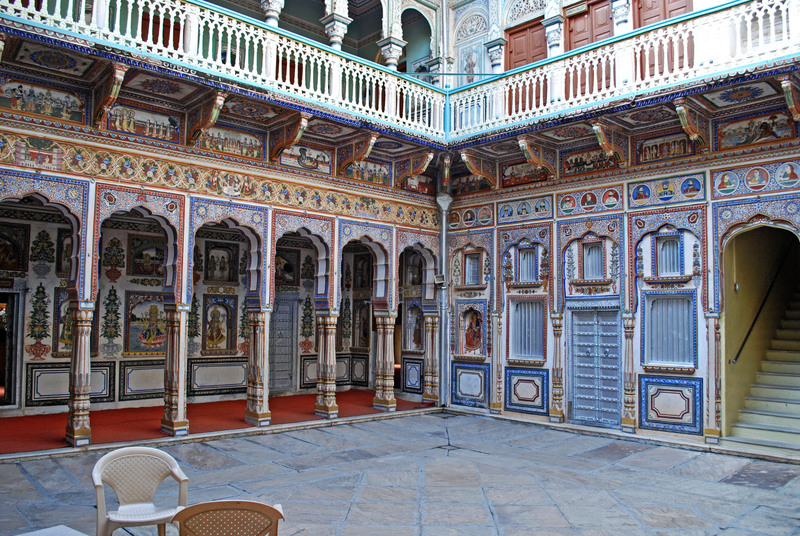 This outer courtyard is known as the mardana (men’s courtyard). More often than not, on one side of the mardana is a baithak (salon) in which the merchant of the household could receive his guests. In order to impress visitors, this room was generally the most elaborately crafted and often featured marble or mock-marble walls. 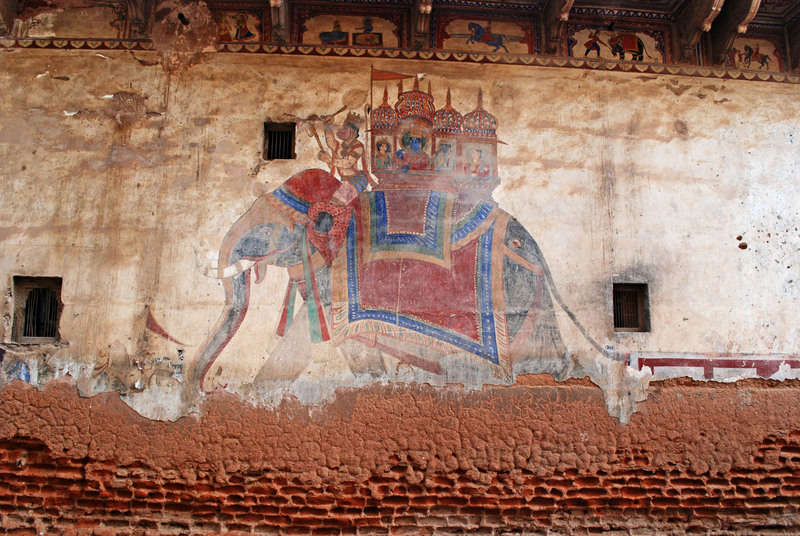 Here, you’ll frequently see images of Ganesh, god of wealth and good fortune. 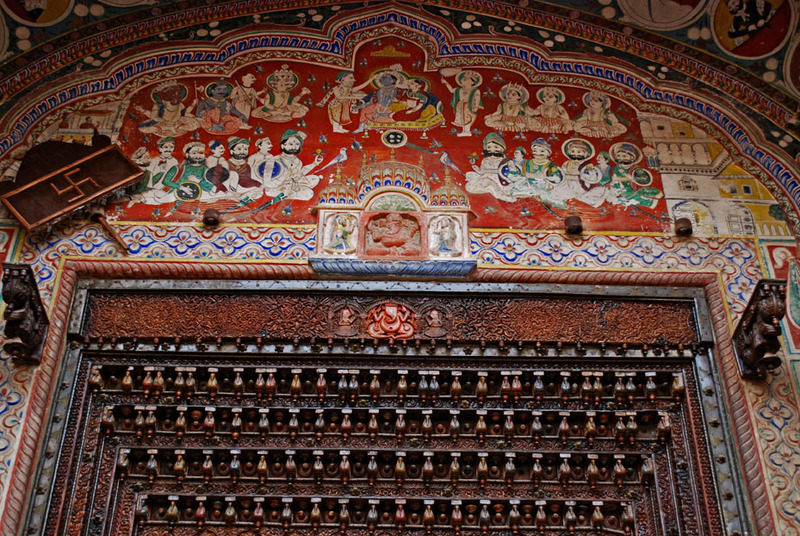 The baithak usually came equipped with a manually operated punkah (cloth fan). 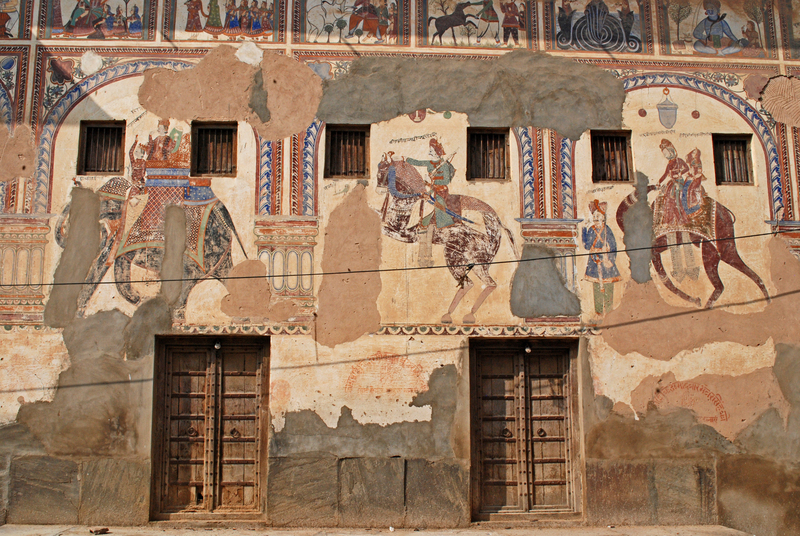 Opposite the baithak is often a stable and coach house, called nora for accommodating camels, horses or elephants. A turn of the century garage, if you will. 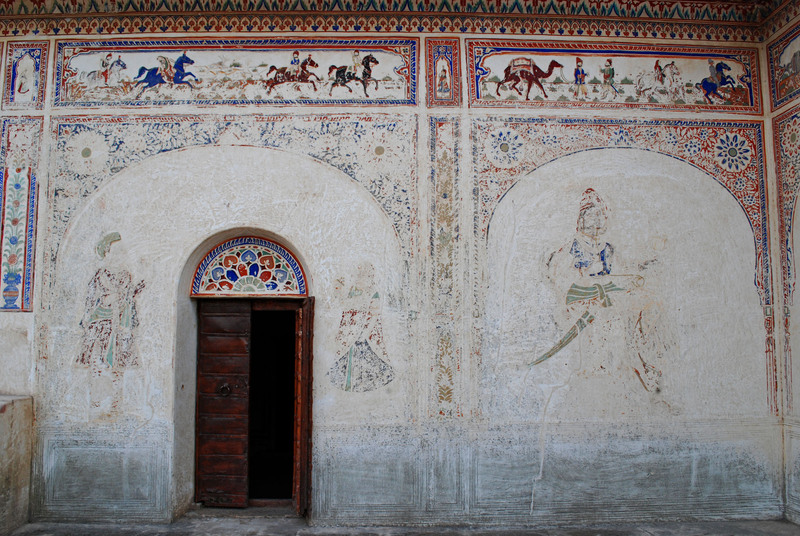 A wall separates the outer mardana from the inner zenana (women’s courtyard). Between the two courtyards there was often a small latticed window, through which they could peep out at male guests. Sometimes, there was also a screened-off balcony, known as the duchatta, above the mardana for them to spy on proceedings. 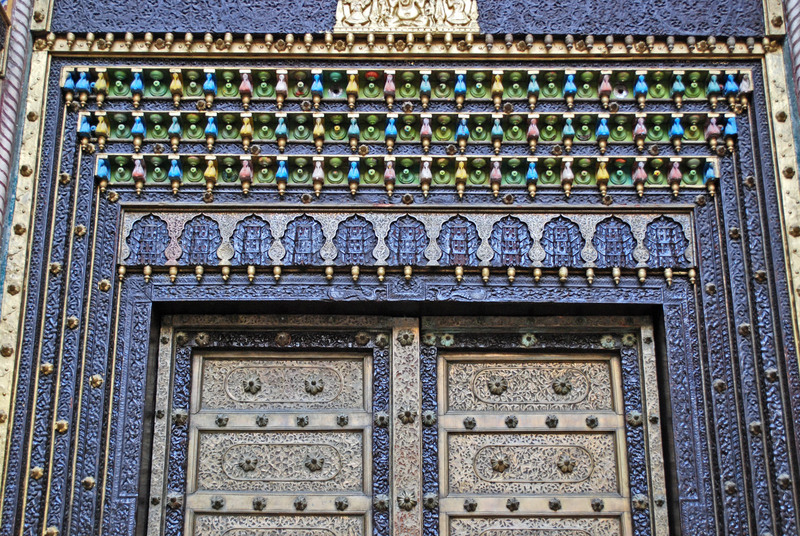 Entry into the inner courtyard was restricted to women, family members and, occasionally, privileged male guests. The zenana was the main domestic arena. Rooms off this courtyard served as bedrooms or storerooms, and staircases led to galleries on upper levels, which mostly comprised bedrooms – some of which were roofless, for hot nights. The courtyard arrangement, together with thick walls, provided plenty of shade to cool the inner rooms, a vital necessity in this sun-scorched land. 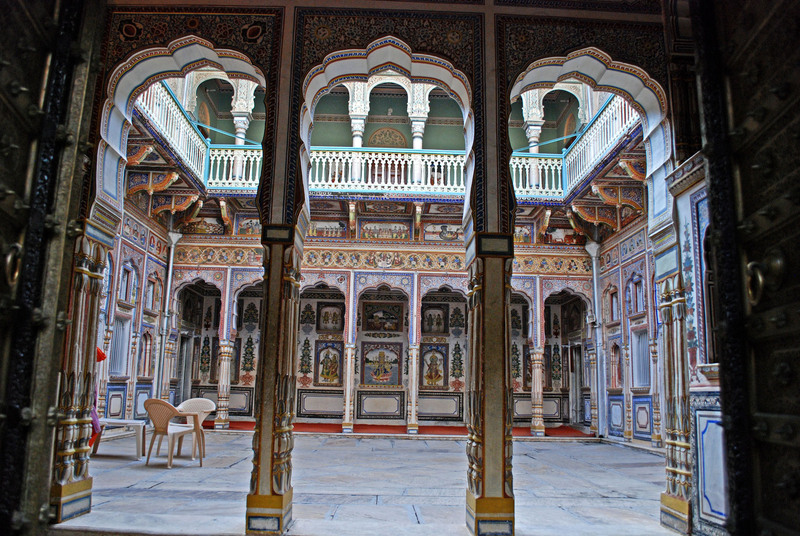 The haveli thus provided everything for the women and there was no need for them to venture into the outside world – and in Shekhawati these were spectacularly gilded cages. In the wealthiest of families, there were far more than two simple courtyards, some havelis enclosing as many as eight, with galleries up to six storeys high. 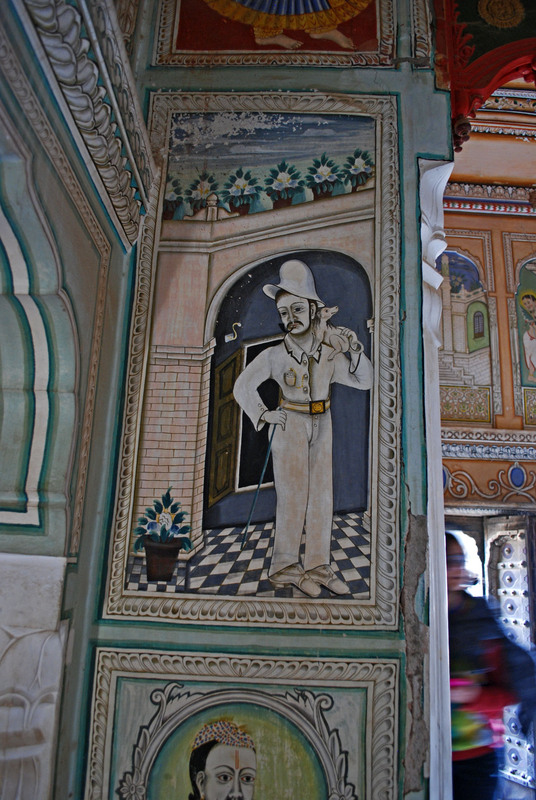 This meant plenty of wall space to house the elaborate murals that wealthy Shekhawati merchants were so fond of commissioning. Artists who painted this train had clearly not seen one in real life. Can you spot the Rohit? 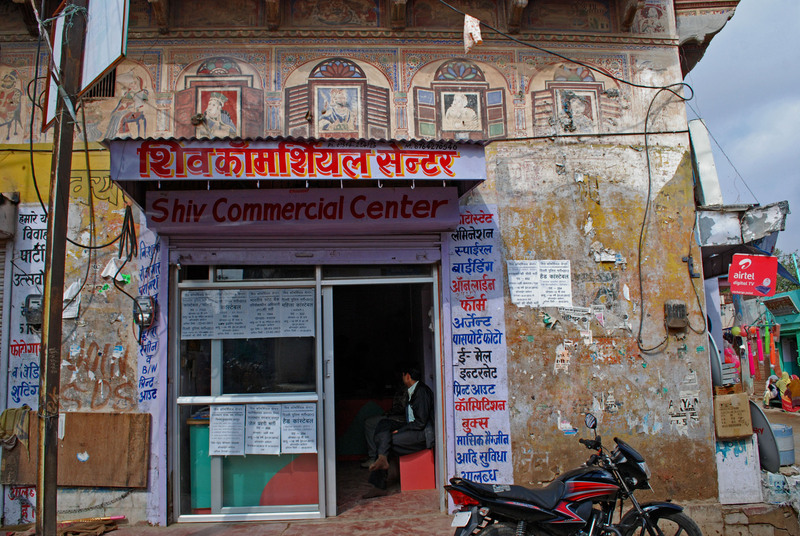 Our next stop was Bhagton ki Chhoti Haveli. 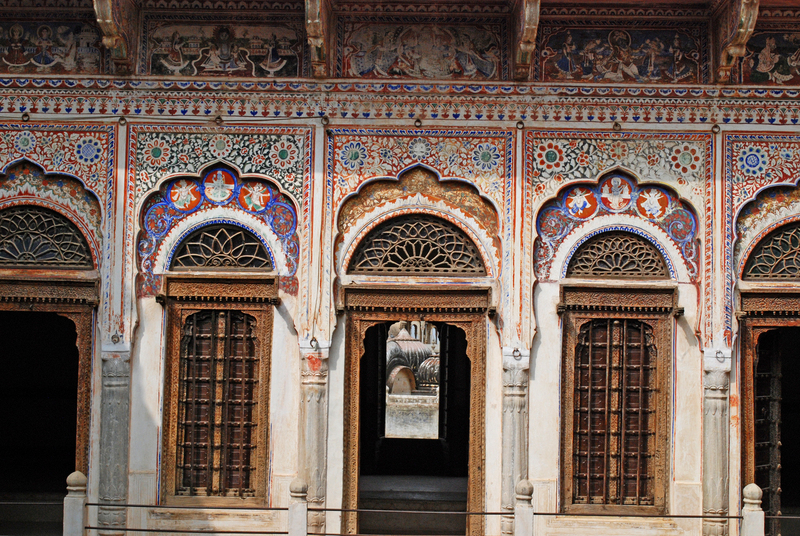 Located at the end of a narrow lane, off the main bazaar, this haveli has one of the most striking doorways. 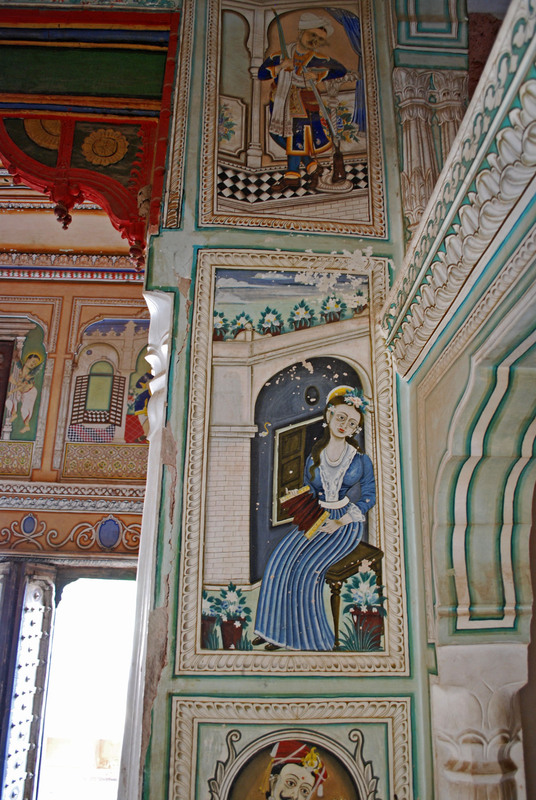 The frieze on top is a gallery of portraits depicting both locals and Britons. 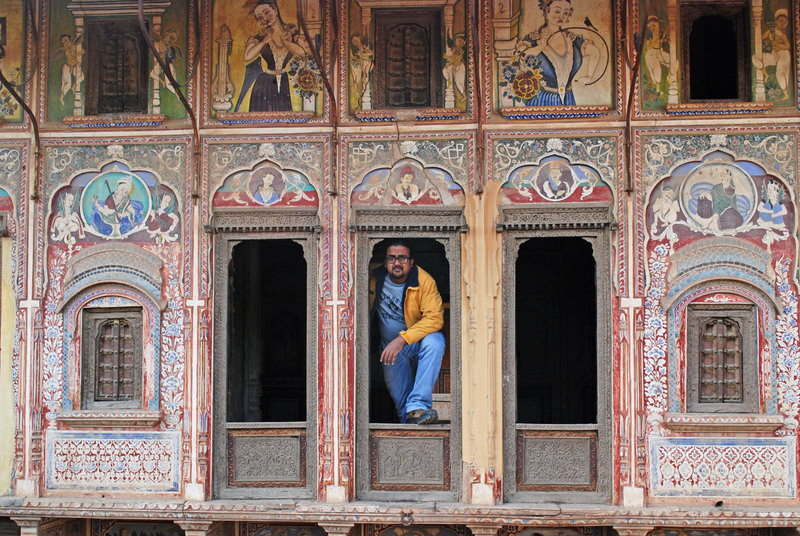 This haveli felt more compact and personal than the others we had seen so far. 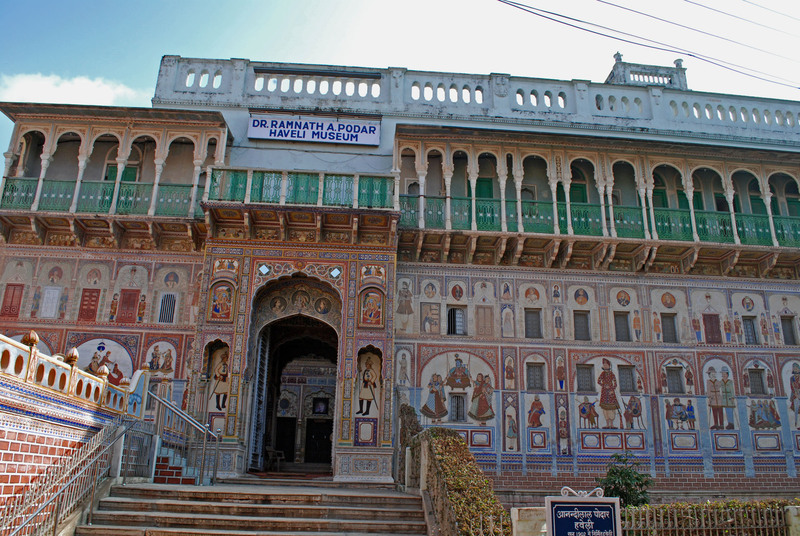 For our last haveli, we came back to Morarka where we had started the walk from, and walked past it to Dr Ramnath A Podar Haveli Museum. 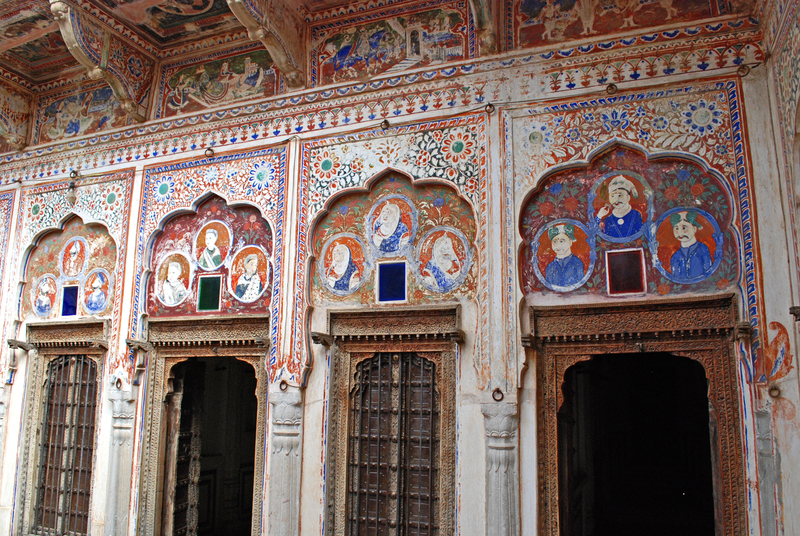 As the name suggests, not only is this a haveli but it is also a museum on Shekhawati and Shekhawati’s culture. 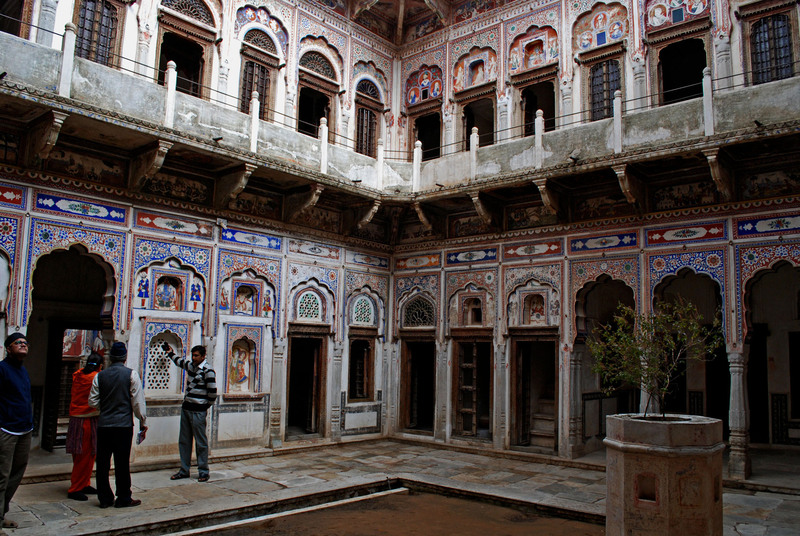 This is one of the best preserved havelis around. In fact at times, one tends to feel that maybe it is a little too looked after. 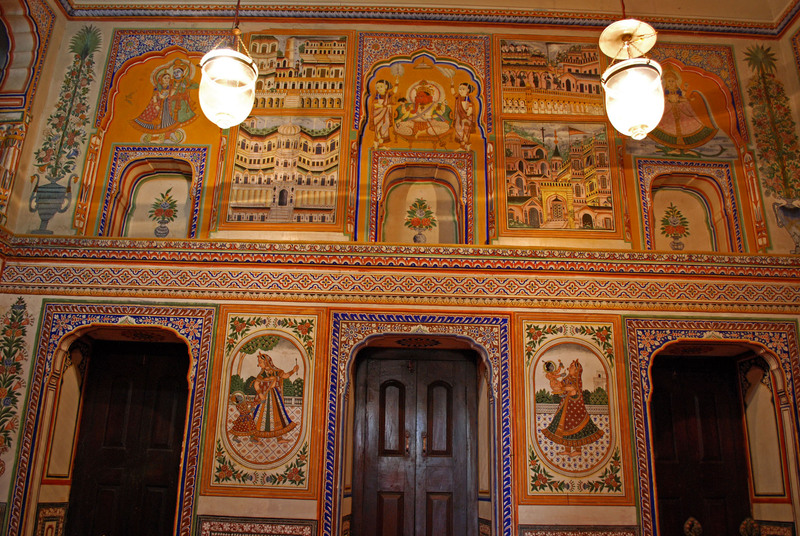 Various rooms of the haveli have been converted into individual galleries displaying musical instruments, models of forts of Rajasthan, headgear, etc. 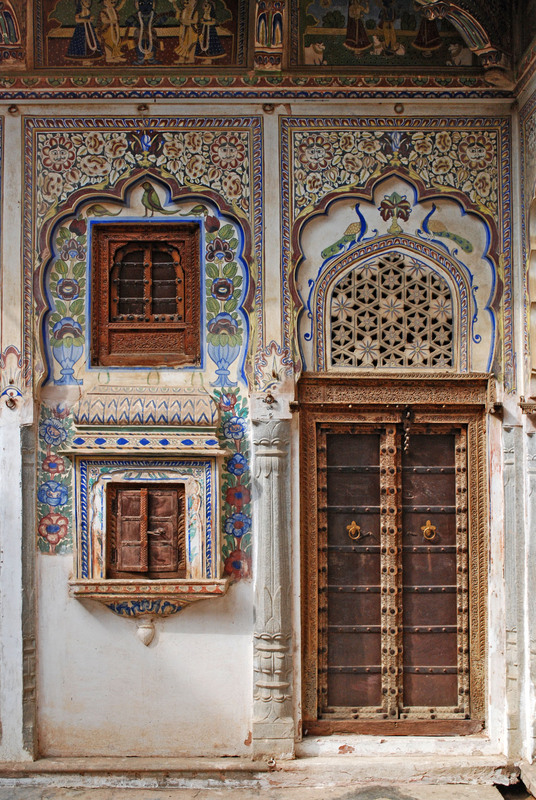 The exquisite doorway to the haveli. The caretaker will point out (with much pride) that an image of the gateway was once adorned the cover of Air India’s in-flight magazine! 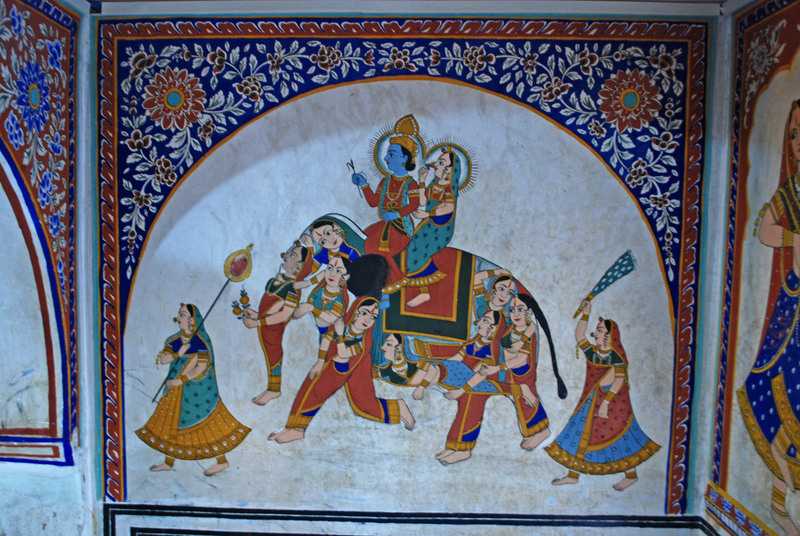 Another attraction of the haveli – an elephant made entirely of ladies! 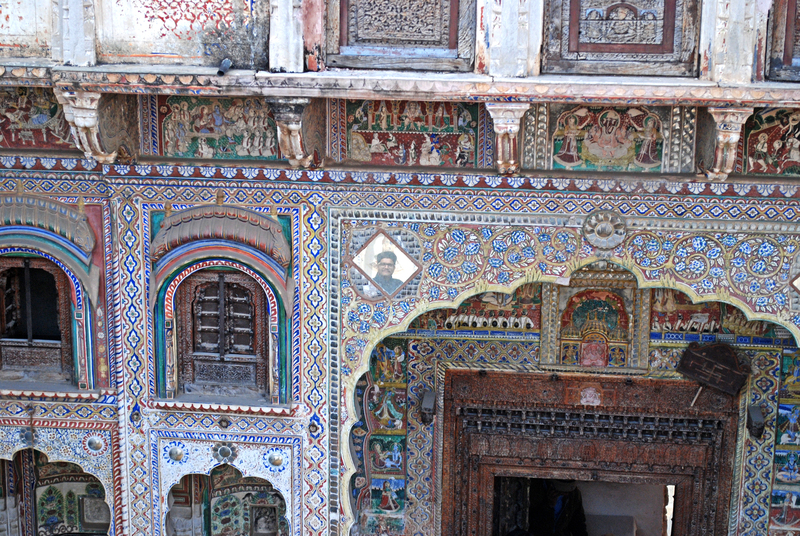 For each haveli we managed to visit, we skipped two. It is amazing how this corner of the country produced so many families with so much wealth. In the post, we will look at some photographs from the rural (not that Nawalgarh can be called ‘urban’) part of Shekhawati. Expect colours! Money meets bad taste haha :). But in this case great content meets great pics. 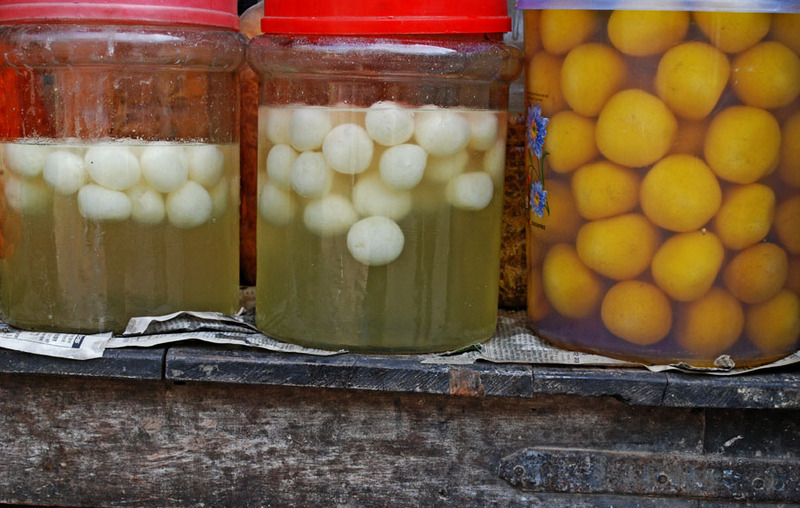 Want to go there! You are very good for my ego, Asavari. Thank god for that! Good description of the havelis. 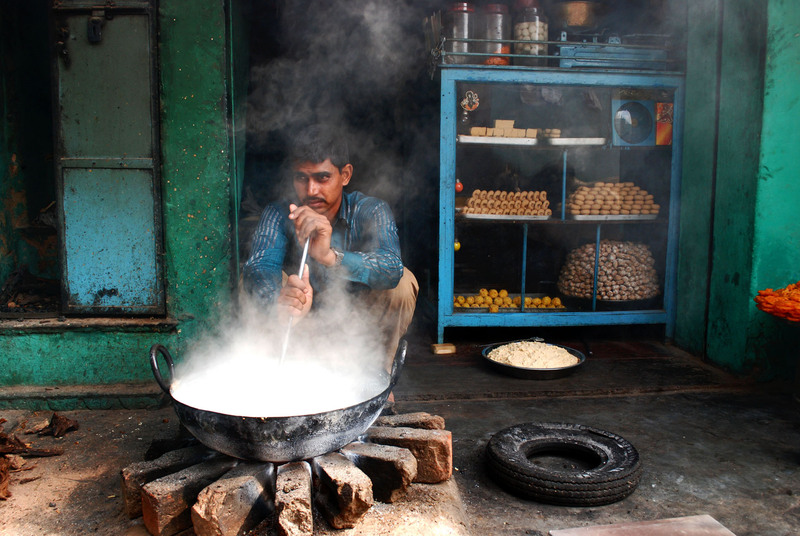 Nawalgarh is a good place to haveli-hop! Very original. Informative description and beautiful captures. 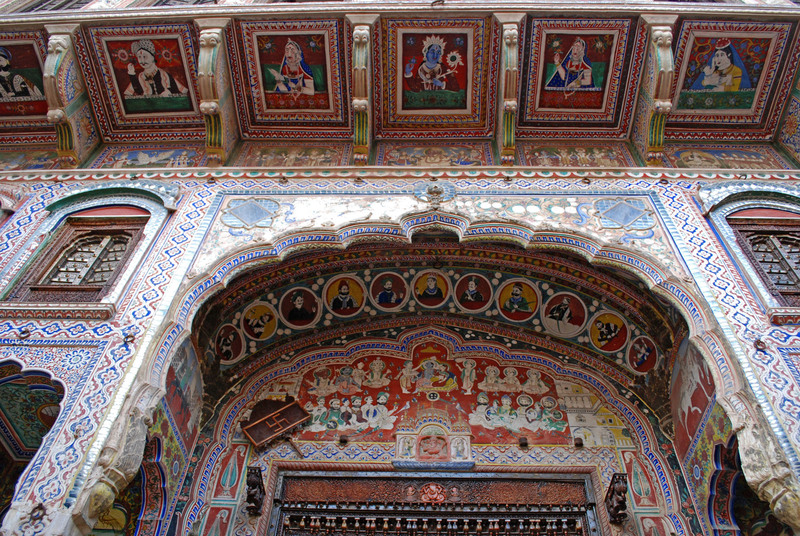 There are 32 Thikanas, in total, in the Shekhawati region comprising districts of Churu, Jhunjhunu and Sikar. I have visited and documented 24 since 1996. There have been 6 visits of various thikanas in total and half of them repeat after a gap of on average 6-10 years. 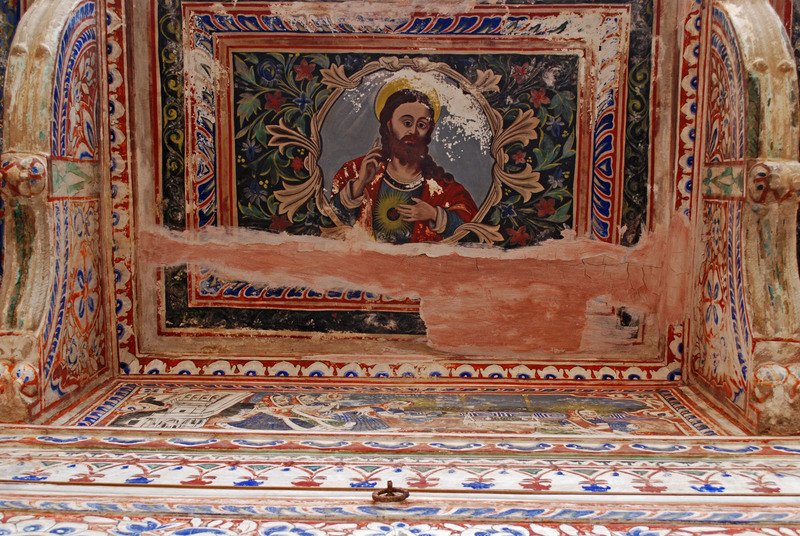 I found out that decorative features such as paintings in half the number of havelis have deteriorated in addition to the fact that these dwellings have shown signs of structural distress and physical stress. 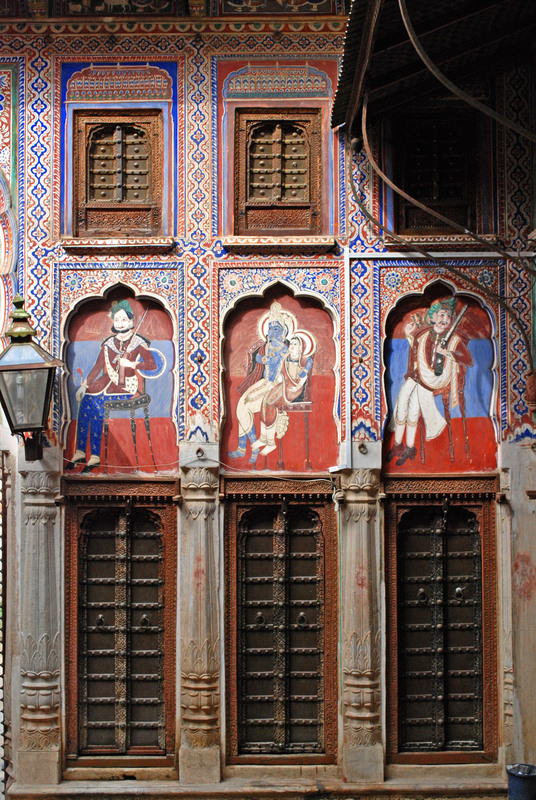 The unscrupulous use of spaces within and outside havelis have played havoc. 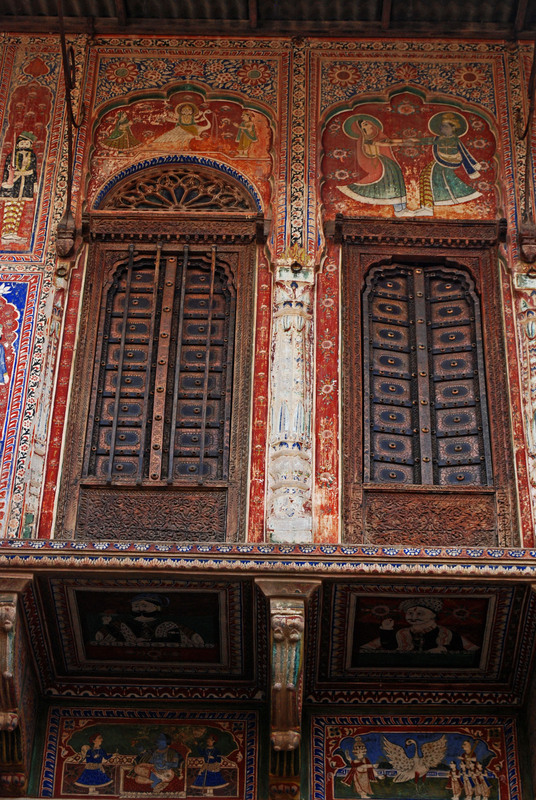 There is no scheme of promoting good and enduring practices for the preservation of the land of painted havelis. In another thirty years 90 per cent of this heritage will get lost. 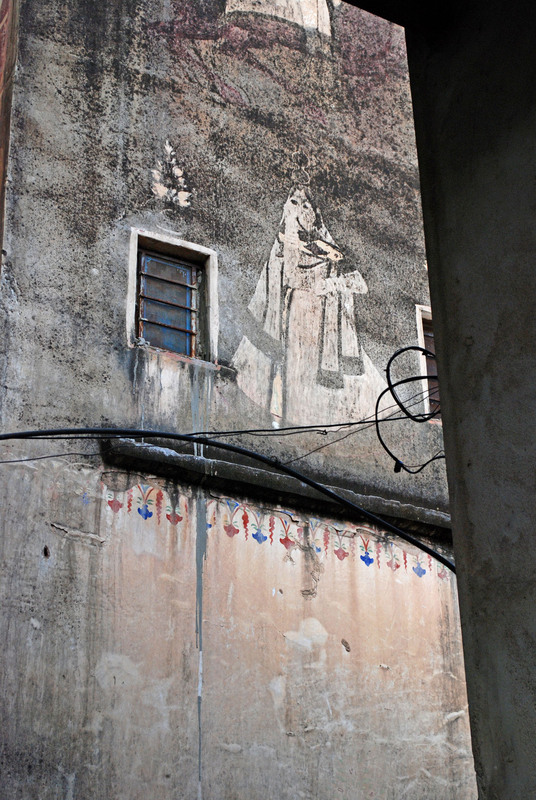 The exhaust fumes of havelis, metalling the street with RCC and tarcoal have stuffed the streets and the natural contact of the sand below with the ambient temperature and moisture has been lost with the result that the water has seeped up the walls. The average rate of demolition of these structures as came to be noticed in Ratangadh, Sujangadh, Nawalgadh, Fatehpur etc. might be 20 per year. This is very sad to hear. However it is also exciting that someone like you is concerned about saving the heritage. 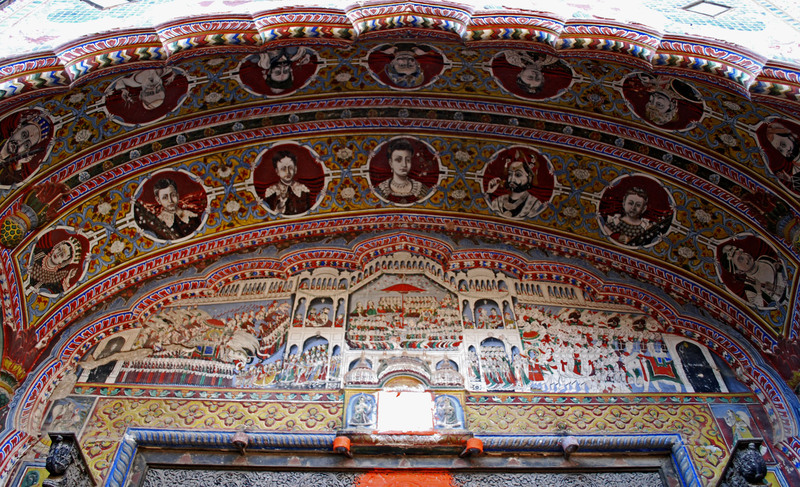 One of the better blogs I read on the Shekhawati region. the pics are beautifully projected.